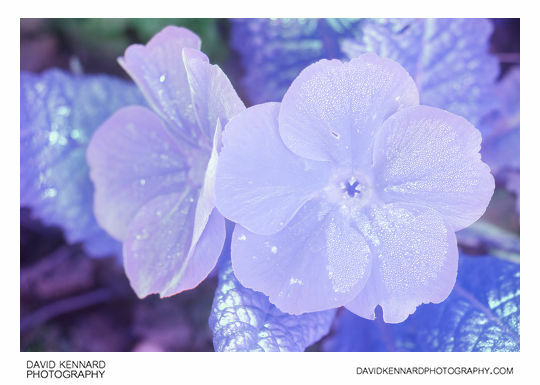 About a week ago we had some nice calm weather and lots of flowers were out in the garden, so I took advantage of the situation to take a few ultraviolet flower photos. 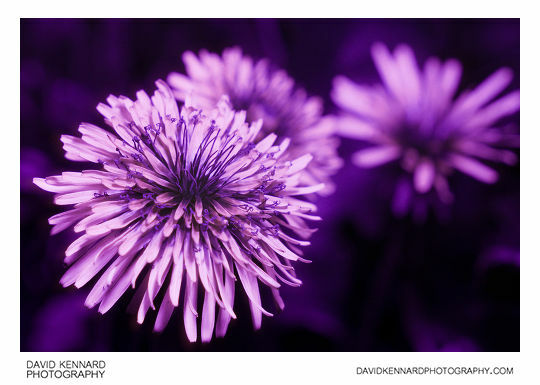 Previously my ultraviolet flower photography has been mainly restricted to cut flowers shot indoors. 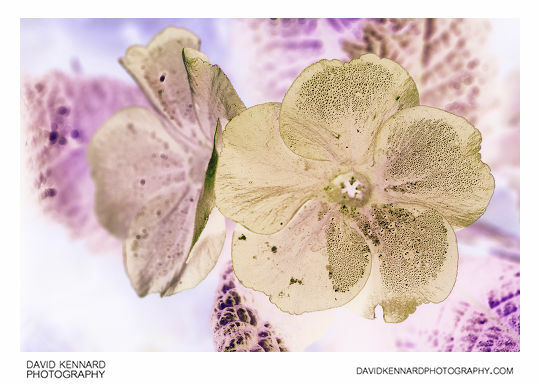 It is thought that flowers have these hidden ultraviolet markings in order to attract insects (for polination), which can see in part of the ultraviolet spectrum. 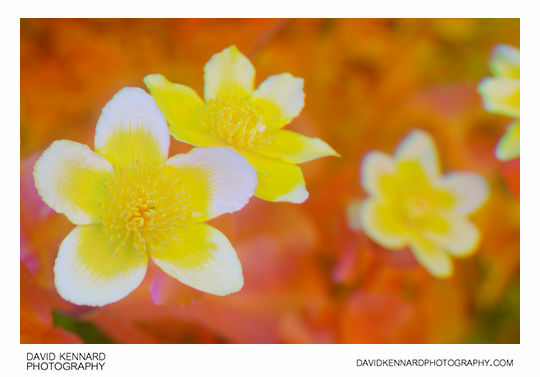 I haven't photographed a lot of flowers in ultraviolet, but the majority of ones I have photographed in UV do not have any ultraviolet markings. So I don't think ultraviolet markings can be very important in attracting insects. 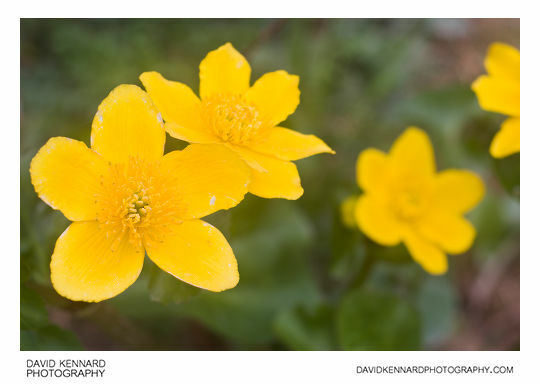 Below is a multispectral image of the Marsh Marigolds. It is an RGB image, with an infrared image used for the red channel, a visible light image used for the green channel, and an ultraviolet image was used for the blue channel. The image shows the colour of the flowers (yellow), the ultraviolet pattern (brighter at the edges of the petals, darker at the centre). And it shows the high infrared reflectivity of the leaves (red leaves). Below is another multispectral image, this time of a garden primrose flower. 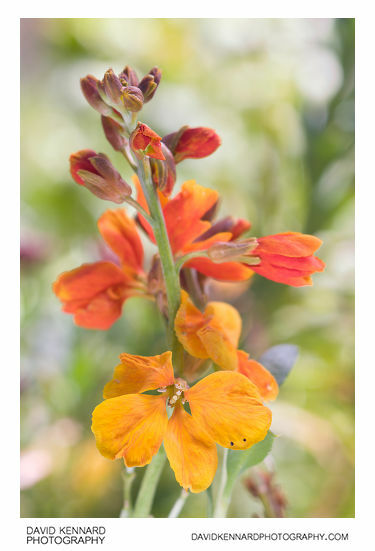 This flower is plain orange in real life, it doesn't have any ultraviolet markings. 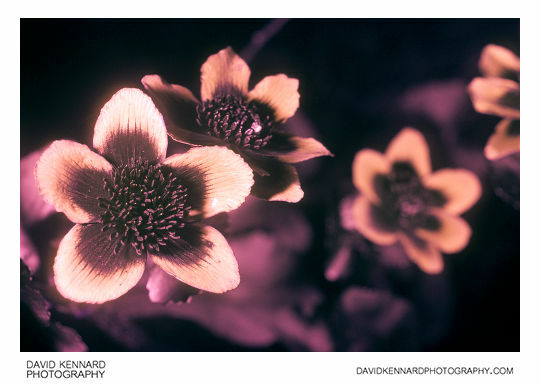 I also created a couple of other multispectral images of this flower, just by changing the way that the UV, IR, and visible light images were blended together. For the above image I created three Colour Fill adjustment layers in Photoshop, one blue, one green, and one red. Underneath these was a white color fill layer. The blue layer had the ultraviolet image used as a layer mask. The green layer had the visible light image used as a layer mask and was put in Hue blend mode. The red layer had the infrared image used as a layer mask and was put in soft light blend mode. The black dots you can see on the flower petals are dew drops. They only cover part of the flower as the petals from the other flower were originally covering the part of the flower with no dew. Above is another variation, I'm not sure exactly how I processed it though. 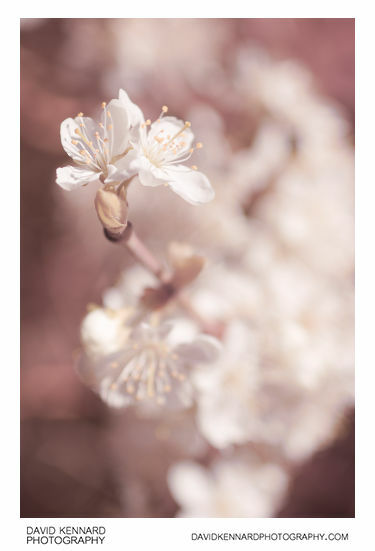 Below is a full spectrum photo of plum blossom. Rather than being a combination of 3 separate photos covering UV, IR, and visible light, this is just a single photo taken with no filters. Due to small amount of natural UV light, and the low sensitivity of my camera to UV, this photo is really just an IR and Visible light photo. I did take a UV photo of the plum blossom as well, but it doesn't have any UV markings and isn't a very interesting photo. 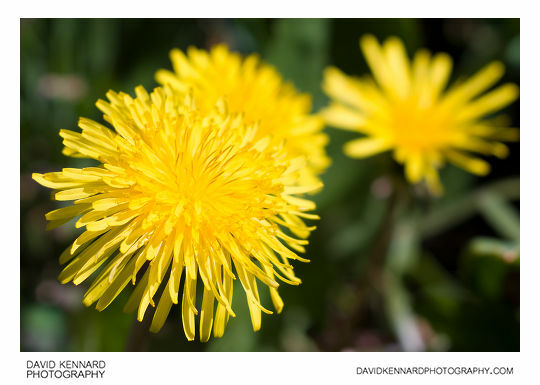 Dandelions, though, do look different in UV than they do under visible light. 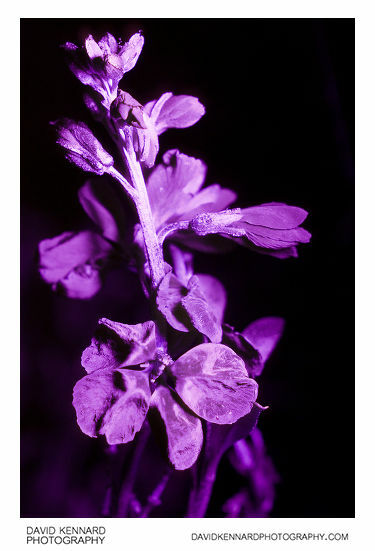 The centres of the flowers appear much darker in ultraviolet. Unfortunately there was too much movement between the different Dandelion shots I took for me to create a multispectral photo of them. In UV it looks different, but it doesn't have any ultraviolet markings. Note that quite a bit of the difference between the UV and visible light images is down to differences in how the shots were lit. The UV shot is lit with flash, while the visible light image is lit with diffused natural light.